For 2008, the Case IH Steiger line introduces five new models including four-wheel drive and Quadtrac configurations with up to 589 peak horsepower and enhanced fuel efficiency. 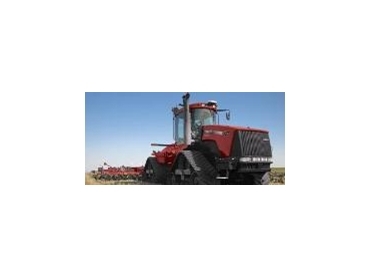 The 2008 Steiger models include a number of Quadtrac and scraper configurations to meet the diverse needs of large ag producers and contractors. All carry a special decal commemorating the 50th anniversary of the innovative design. The proven 12.9-liter engine previously used in mid-sized Steiger models is now enhanced with a new compound turbocharger technology standard in the new Steiger 485. "This is essentially the same engine that has been used in the Steiger 380 and 430 models, with one major change: Turbo Compound technology for outstanding fuel efficiency," says Tom Dean, North American Marketing Manager for Magnum tractors. "Turbo Compound involves two turbo sets working in a series," Tom Dean explains. "The first turbo performs as a conventional turbocharger using exhaust gas to compress air into the combustion chamber. “In the Turbo Compound system, instead of routing the exhaust out the exhaust pipe, it then goes to a second turbine downstream from the turbocharger. “The energy from this second power turbine then transfers power to the crankshaft through a set of reduction gears and a hydro coupling. This provides fuel efficiency gains of up to 3 percent. The result is increased performance, horsepower and fuel economy." Tom Dean adds that while Turbo Compound technology has been used in some on-highway applications, "We believe this is the first time it's been used in an agricultural tractor and will mean outstanding fuel savings for the customer." Because Case IH Steiger customers are pulling bigger, heavier implements than ever, the company made several enhancements to the center-pull drawbar design, while maintaining key center-pull benefits such as load distribution and power-to-the-ground. The hanger bar's size increases from 1.5 to 1.75 inches, improving bend strength by 37% for heavy loads. The hanger bar is now integral to the chassis, improving stress distribution. It now extends through the side frame and is welded on both sides for increased strength. The design uses a 2.5-inch solid bar design with a heavier, 1-inch-thick support plate and is interchangeable between all frame sizes. In addition, the drawbar side-swing angle has been increased 29%, reducing front frame side loading and improving ride quality. These combined designs provide a durable drawbar system to handle today's larger implements and larger requirements of the future. Previous Steiger tractors came standard as AccuGuide Ready -- allowing autoguidance to be added in the field. Now, the 2008 models take the growing recognition of autoguidance one step further by offering the complete AFS AccuGuide autoguidance system factory-installed. "For the first time we're shipping tractors with all the autoguidance components installed right at the factory. Growers are adopting autoguidance at a very fast pace with smart features and powerful technologies that deliver all the productivity and profitability our customers expect," says Tom Dean. Exclusively from Case IH, the AccuSteer II system is a four-wheel drive articulated tractor system available on the Steiger 335 model for row crop applications, where precision steering is critical. "The AccuSteer II provides intuitive point and steer operation; allows the front frame to pivot independent of the rear; eliminates the tail wag associated with articulated four-wheel drive tractors for better steering control within rows; and enables easy turns at the end of rows," says Tom Dean. "The system delivers the industry's tightest turning radius for 4WD tractors, at 12.4 feet." AccuSteer II was recently awarded the prestigious AE50 award from the American Society of Agricultural and Biological Engineers. Design enhancements for 2008 include improved performance and reliability; system hydraulics and electronics integrated with the base tractor; all new steering angle sensors and steering wheel encoder; and a make-up system to overcome drift. In 2008 models, the use of B5 biodiesel is fully approved for all Steiger tractors. Higher blends also can be used -- B20 in all models and B100 in the 385, 435 and 485 - with use of required Case IH biodiesel maintenance practices. "Case IH is committed to supporting and promoting the renewable fuels grown by our customers," Tom Dean says. "This commitment extends to our most powerful, highest-horsepower Steiger tractors ever."